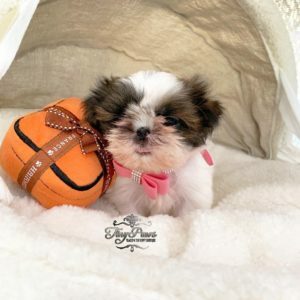 Muffin is a tiny Imperial Shihtzu. She’s got extremely short and stocky body. She only weighs 1.2lbs at 8 weeks and estimated at 3.5-4lbs fully grown . She’s already putty trained on wee wee pads. She’s hypoallergenic. She comes with health certificate, registration, microchip and a health guarantee.